TURNER — Eight-tenths of a second at the end of basketball regulation equals enough time to catch and shoot. Not enough of a window to think, react or even take a full breath, which probably made it an ideal situation for a sophomore to apply the finishing touch on the finest game of his young career Thursday night. Mitchel Davis grabbed the inbounds lob from Levi Morin and banked in a relatively uncontested four-footer at the buzzer, lifting Leavitt to a crucial 55-53 KVAC boys’ win over Nokomis. Davis finished with 14 points, 16 rebounds, five steals and four blocked shots for Leavitt (4-8), which vaulted back into prospective Western Class B playoff position with the victory. The Hornets hadn’t won since Dec. 29, dropping four in a row and seven of their previous eight. Andrew Middleton led Leavitt with 16 points. Isaiah Calder added 13. 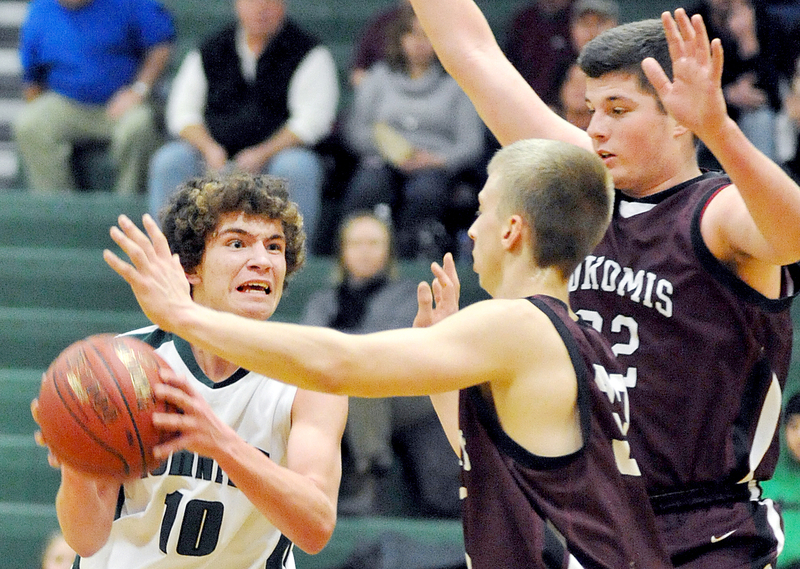 Leavitt overcame a sensational game by Spencer Hartsgrove, who concluded with 30 points, six rebounds and six steals for Nokomis (6-5). Hartsgrove had 20 of the Warriors’ 26 points in the second half. “It’s really big. 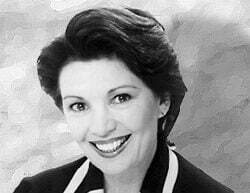 We’ve been losing, so this puts us back in it,” Davis said. Drew Wing forced the fourth tie of the second half when he got the shooter’s roll on a 3-pointer from the left corner with 10 seconds remaining. 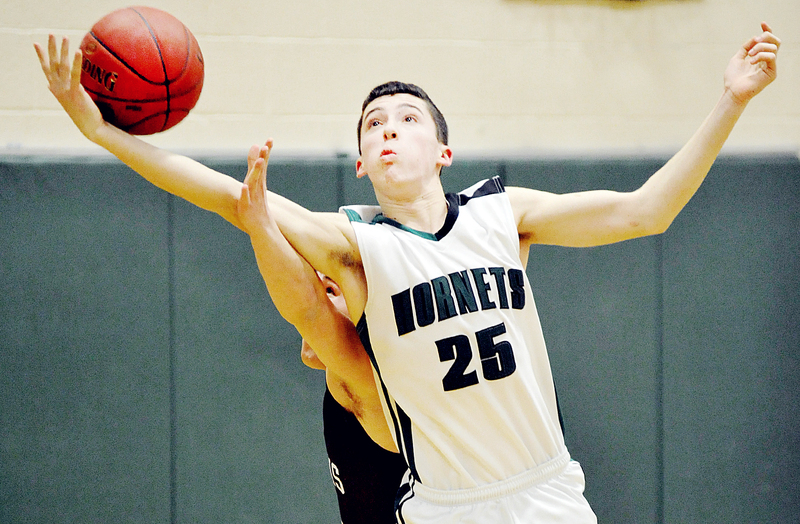 The Hornets’ first bid for the game-winner was a drive and an errant runner by Zac Goulette. Middleton briefly held the rebound but had the ball stripped away by Hartsgrove before it trickled out of bounds with time remaining. Just enough time for Leavitt to convene and concoct the winning strategy. 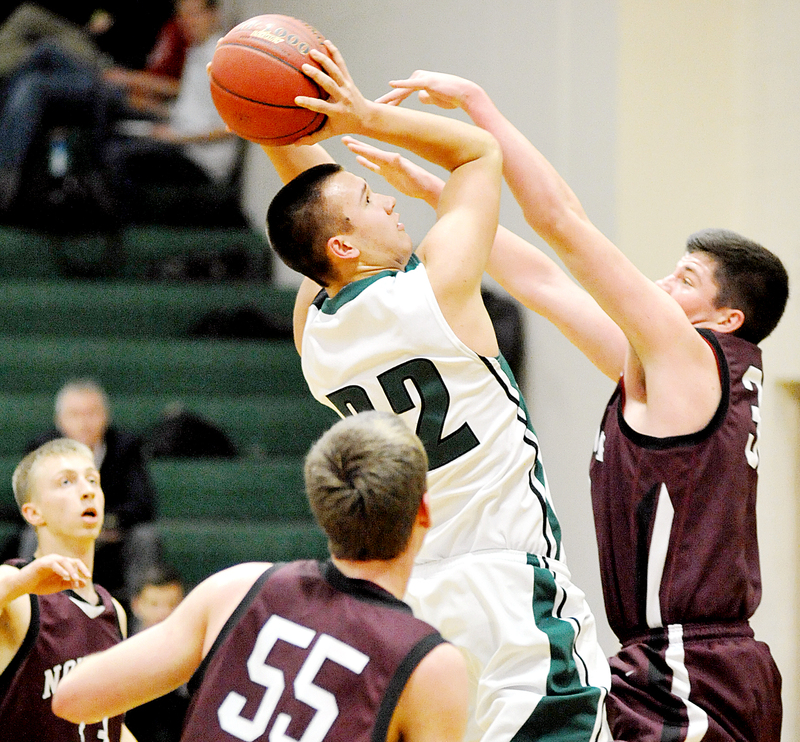 And with Nokomis’ defense sagging on the explosive Middleton, Davis was the ideal option. Davis also was instrumental with eight points in a first-quarter run to an 18-6 lead. The advantage stayed at a dozen on two Middleton free throws with 6:02 left in the half before the Warriors rallied. 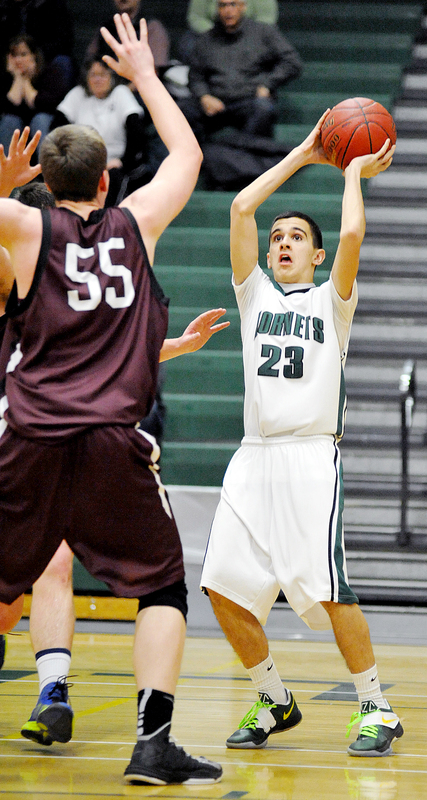 Hartsgrove’s drive and a 3-pointer by Devan Haas triggered a 9-0 run. Chandler Foss and Wing each added two points to the mix. Two free throws from Hartsgrove and an inside bucket by Foss (10 points) in the final 48 seconds put the Warriors in front, 27-26, at the break. Nobody but Hartsgrove scored in the third period for Nokomis. Goulette’s five points and Middleton’s four along with buckets by Calder and Austin Anderson countered for Leavitt. It was knotted at 39 with eight minutes to play. Calder canned a 3-pointer to put Leavitt in front with 4:48 left. It was the sixth and final lead change of the night.